The 2015 season is almost upon us and we are excited for what it will hold. The Midland RockHounds will host Military Appreciation Weekend sponsored by ProPetro Services on May 14th-16th. 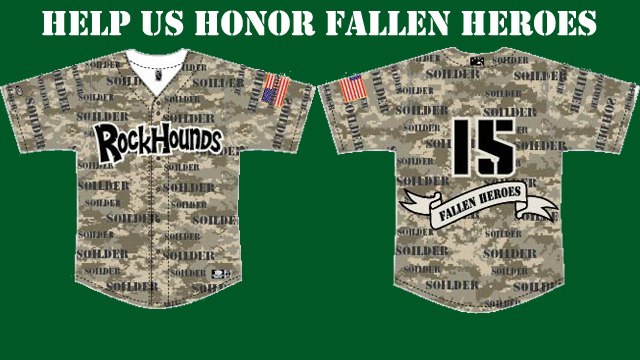 Throughout that weekend, the RockHounds players will be wearing specialty jerseys that will show the names of fallen heroes from around our community. These jerseys will be auctioned off with the proceeds going to a local charity, which will be determined at a later date. We would like for our fans to submit names of family members or friends that have died honorably protecting our country, so that we can honor them by placing their names on the jerseys. Names will appear on the jerseys in the locations where "SOLDIER" is located on the above jersey artwork. Please send all names and information to Courtnie Golden at cgolden@midlandrockhounds.org, (limited to the first 50 names submitted). If you have any questions, feel free to call us at 432-520-2255.